Note: Prices are seasonal and subject to availability. Please enquire for group bookings and events. 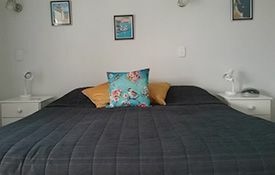 Spacious 1-bedroom unit with queen-size bed and single bed in separate bedroom and one queen-size bed in large lounge area. Full cooking facilities. Perculated coffee/plunger/biscuits/tea provided. Toiletries supplied. Serviced daily. Hairdryer/ironing, LCD flatscreen TV with Sky Digital. This not-so-small studio unit has a super-king bed. 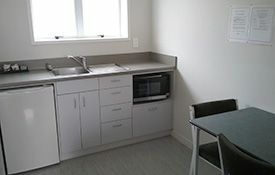 Kitchenette facilities: toaster, microwave and fridge, perculated coffee/plunger/biscuits/tea provided. Toiletries supplied. Serviced daily. Hairdryer/ironing, LCD flatscreen TV with Sky Digital. 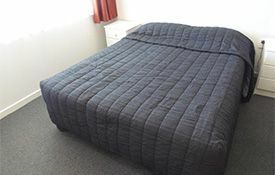 Large studio unit with queen-size bed and single bed in spacious lounge area. 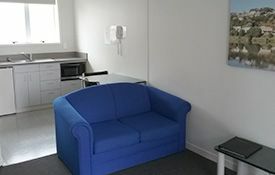 Kitchenette facilities: toaster, microwave and fridge, perculated coffee/plunger/biscuits/tea provided. Toiletries supplied. Serviced daily. Hairdryer/ironing, LCD flatscreen TV with Sky Digital. 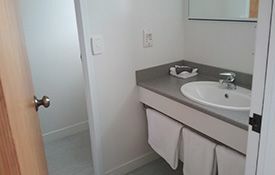 Spacious 1-bedroom unit with three single beds in separate bedroom and one queen-size bed in large lounge area. Full cooking facilities. Perculated coffee/plunger/biscuits/tea provided. Toiletries supplied. Serviced daily. Hairdryer/ironing, LCD flatscreen TV with Sky Digital.